Charlton, aka Iruska Allen, is a 7-year-old red fawn male, born August 22, 1999. 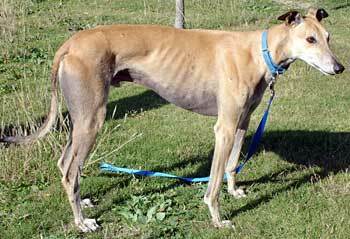 Charlton's dam is Iruska Avalon and his sire is the famous Grey's Statesman, a finalist in several Derby Classics and a sire to over 5,000 Greyhounds. Charlton chose not to follow in his racing dad's footsteps, and was adopted into a family almost four years ago. Charlton was returned to GALT when his family recently moved into an apartment complex that does not allow dogs. 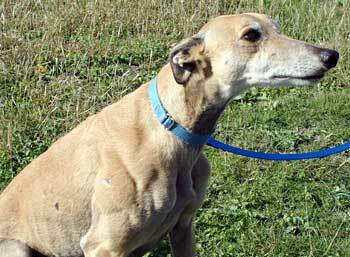 Friendly, outgoing, and a total ham, Charlton fits in very well at his foster home with a small toddler and the other resident Greyhounds. A cat is also in the picture, and Charlton's foster family is slowly making the necessary introductions. Charlton was named for Charlton Heston, because he is so handsome. He came to us about a month ago (after living in an adoptive home for about four years) and has adapted very well into our household of two other greyhounds (male and female), two cats, and a toddler. He is a very sweet boy and an attention ham. He will let you rub and massage him for as long as you'd like - he wouldn't care if it was all day! If you're on the floor, he'll even crawl into your lap for some loving, because he doesn't realize he's so big. Charlton has very good manners - he doesn't beg for people food and will lie patiently on his bed until it's time for him to eat. He loves to eat, though, and given the opportunity for any doggie treat or human food crumbs, he will take it. Charlton loves to go walking, and at his former home he walked two miles a day. He walks a couple times a week with us. He doesn't pull and is very gentle and happy to just walk right by your side. He prefers walking to running, however, and doesn't really feel the need to exert energy by running laps in the backyard. He's quite content to just walk or follow others at a jogger's pace if they decide to play. Charlton loves his "babies." He has to go find his "baby" any time he comes in from outside. He runs, grabs it, plays, then rests his head on it when he's finished. He just discovered the "screaming monkey" in the house. He is fascinated by that sound. Charlton's favorite thing to do is to "cockroach" on his bed. He lounges around all day with the other hounds. He does tend to get into mischief with the other hounds when left to roam in the house when we're gone, so he goes into his crate when we leave the house. Not sure if he was the instigator or follower in some of the situations. He crates well and usually "goes to bed" easily with a nighttime cookie. We were told that he was a major squirrel chaser in the backyard and would chase the cat in the backyard at his previous house; however he lived cohesively with a cat for four years. He hardly notices our cats. Our cats are not 'on guard' with him at all. I would say that he is cat tolerant, but as with all greyhounds I would recommend monitoring him inside or outside for a while with any small animals. He has seen small dogs at PetSmart, but didn't really pay close attention. He lets us know it's time to "go potty" by nudging you harder than normal. At first I thought he just wanted more petting but figured out that is his "signal." He knows that word, so when asked, "Do you have to go potty?" he responds by running to the door. He also knows how to "sit" and "lay down," which can be a major feat for a greyhound, but he does it with ease. We let him out several times a day. He does like to mark, but he saves this for the outdoors or for public places like going to PetSmart - we just use the belly band to prevent it there. Charlton is an easy-going, "middle-of the pack" dog who just loves to be loved and is enjoying his life in retirement!